Sorry I've been missing lately! I've been busy working on photo sessions for clients and planning my baby girl's FIRST birthday party! Yes, it has been a year since baby girl came into our lives. I can't believe it! We're doing The Very Hungry Caterpillar as the theme. I hope to take lots of pictures and post about our party afterwards, so be looking for that. 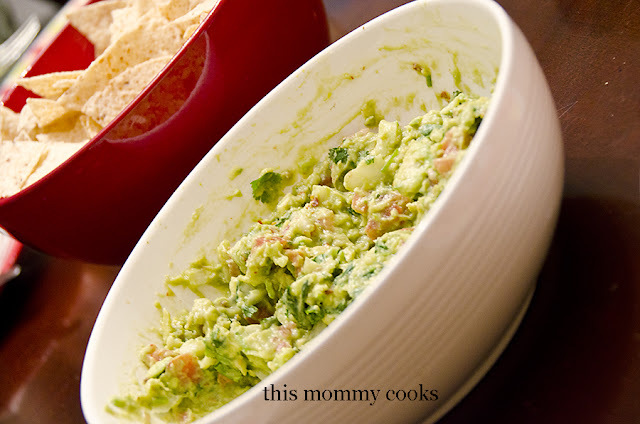 But for today, I wanted to share this awesome (as the name states) guacamole. It was so good! My friend, Kathy, brought it to our cooking club that met earlier this month and it was devoured by all! Definitely try this. It isn't hard and it is so good! Add more or less of your favorite ingredients. *We like a lot of cilantro and garlic, so we added a bit more than the recipe calls for.